It’s no secret that my favorite restaurant is Butcher and Bee in Charleston, South Carolina. Located just north of the downtown historic city, Butcher and Bee would post their daily menu on Facebook every morning. The menu was small but incredibly creative with lots of choices for carnivores, Vegetarians, and Vegans alike. A little something for everyone. I would squeeeee with delight whenever I saw the BBQ pulled squash on the menu. It is amazing. 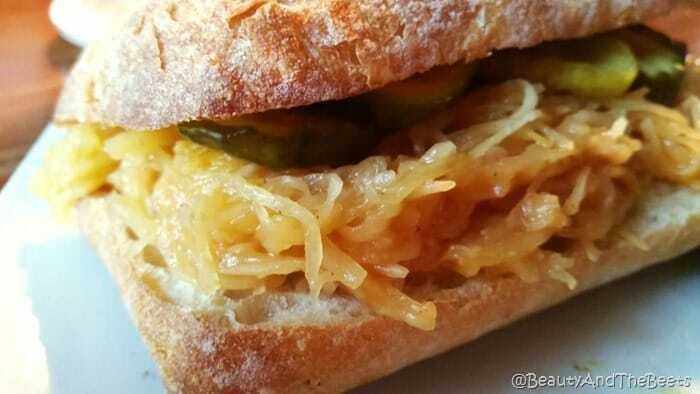 There is something so fascinating with a BBQ vegetable sandwich that can stand up to its meat counterparts. In my opinion, pulled squash is just as tasty, if not more tasty than using jack fruit. BBQ jack fruit is really the trend right now for Vegetarians. It’s been quickly gaining popularity and is making its way to menus all over the United States. I happen to think the squash version is also amazing. So everything is going along smashingly well. Every trip I make to Butcher and Bee I am ordering my BBQ pulled squash. Life is good, I am happy, everything in my life is in perfect order. And then…..my entire existence came into question, my universe suddenly imploded into itself…..there was no more BBQ pulled squash. Squash season is over. Butcher and Bee changes their menu with the seasons. I didn’t see it on the Facebook menu anymore. I race down to the restaurant and scour the daily menu written on the blackboard by the entrance, there is no more BBQ pulled squash. A piece of me died that day. After allowing myself a few days to mourn, I picked myself up and decided I was going to bring BBQ pulled squash to me. I combed through countless recipes on Pinterest for BBQ sauces, and decided to try my hand at making my own beloved BBQ pulled squash sandwiches. Except I have never tried to cook spaghetti squash before so I kept the pizza man on speed dial just in case. Squash is ugly, and hard to cut, so be gentle and cautious. After cutting the squash in half, I scooped out the seeds and guts, then sprinkled the remains with a little salt, smoked paprika and dark brown sugar. I roasted it in a 375° oven for 40 minutes. The fun part was after the squash cooled down a little, I started to scoop the flesh and it magically turned stringy- like spaghetti. I mixed in a BBQ sauce, careful not to drown the squash. I only wanted to enhance the flavor of the vegetable, not mask it. I chose to make a Vegan mustard-based BBQ sauce for a more authentic southern flavor. Once you master the art of roasting the squash, there are endless possibilities to be made, including replacing spaghetti squash with pasta, another very popular trend at the moment. Pretty easy right? 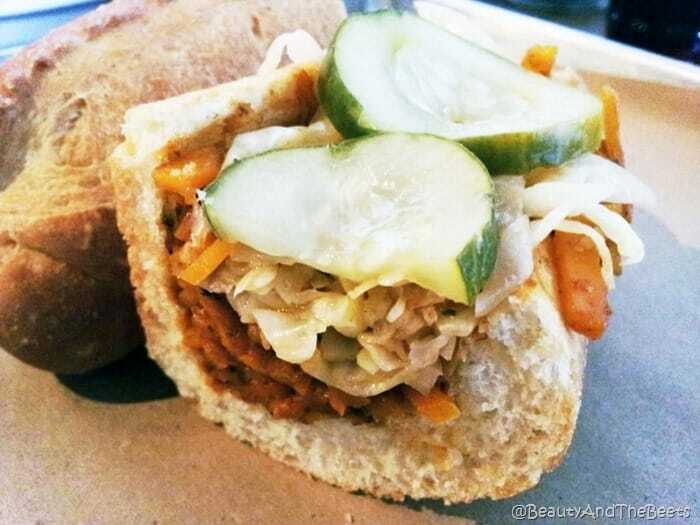 The Butcher and Bee version was also served with a smoked slaw on the sandwich. I did not make slaw but I did chop up some kale and toss it in a light dressing with some peanuts for a healthy side. Based on the sandwich from Butcher and Bee in Charleston. Preheat oven to 375°. 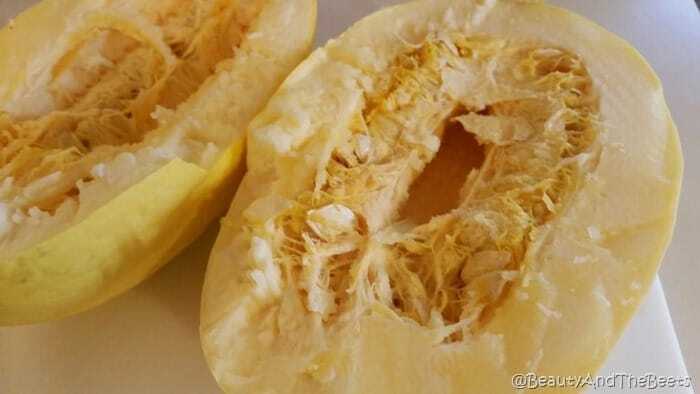 Cut the squash in half and scoop out the seeds and the guts. Place the halves in a baking dish, flesh side up. Brush the flesh with a little olive oil. 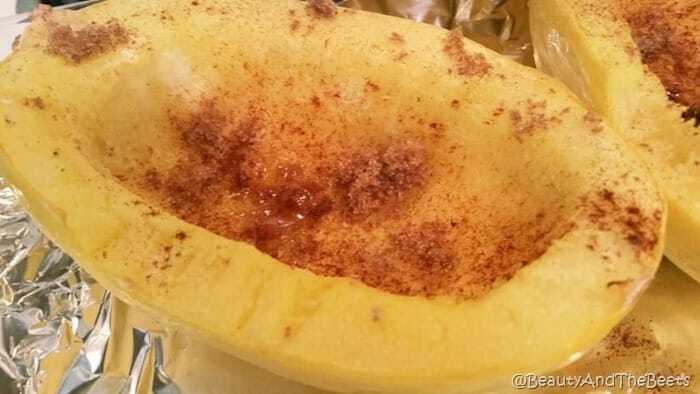 Sprinkle the squash with the salt, smoked paprika and the dark brown sugar. Bake the squash in the oven for 40 minutes. Heat the canola oil in a medium saucepan over medium high heat. Add the onion and garlic and sauté until softened, about 3 minutes. Add the vinegar and stir for 1 minute. Stir in the hot sauce, ketchup, mustard, sugar and turmeric. Simmer on low heat for 10 to 15 minutes or until sauce reached desired thickness. Remove squash from the oven and let it cool enough to handle. Using a spoon, gently scrape out the flesh of the squash into a medium sized bowl.. 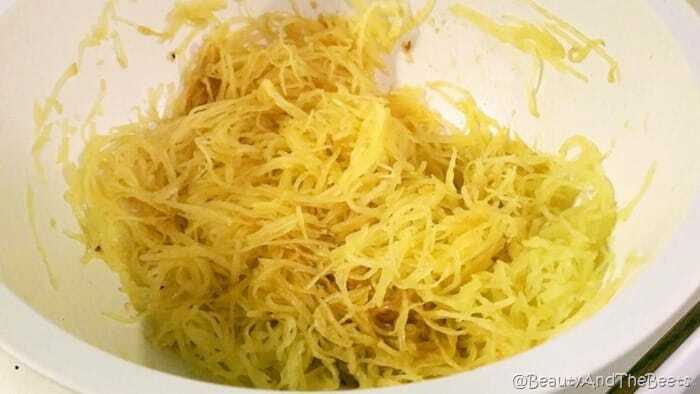 The squash should separate into strings. In the meantime, place the bread in the oven for 5 minutes until toasted. Mix the BBQ sauce into the squash and gently toss. You can also add more spices if desired. Fill the bread up with the squash. 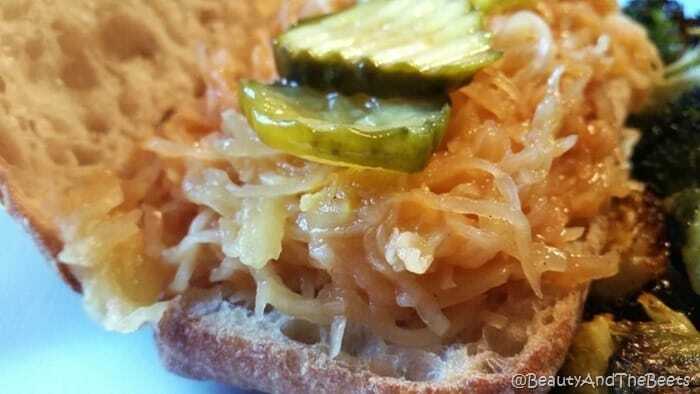 Place a row of bread and butter pickles across the top. A very nice substitute for a meat burger or sendwich, must be delicious. Tadej recently posted..What Is The Best Charcoal Grill On The Market?